Today we’ll be looking at three different Gluten Free baking/pancake mixes; comparing price, ease of use, yield, taste, and I’ll also give each mix a star rating based on price and overall flavor. 1) Glutino Gluten Free Instant Pancake Mix. 6.67 Ounces for $3.97 on Amazon or available at some groceries. Ease of use: Impeccably simple. Add water, shake, pour onto a hot griddle. These took me fifteen minutes from start to finish. Yield: According to the package, 10 – 12 three-inch pancakes. If you want human size pancakes opposed to bird size, there is NO WAY you’ll get twelve pancakes. I got 6 five-inch pancakes. Taste: The flavor was terrible. They don’t cook like regular pancakes, and you end up with rubbery discs of pancake wannabes. There is nothing similar to regular pancakes. In fact, they’re exactly what I was worried all Gluten Free pancakes would be when I went Gluten Free. Price: Overall not terribly expensive for the convenience factor, but if you’re like me and prefer to spend your money on things that taste good. This is not your best bet. 2) Gluten Free Bisquick. 16 ounces. Roughly $5 at Walmart/Kroger. Ease of use: Simple. Stir together mix, milk, oil and egg until well blended. Pour onto griddle. These took me about 25 to 30 minutes from start to finish. Yield: According to the package, ten pancakes. I can usually get 12 though. Taste: These pancakes are delicious. I add about a tablespoon of baking powder to make them fluffier, but other than that; these are fantastic! These are the kind of pancakes that you wonder if they accidentally mixed up the glutenous mix with the Gluten Free Mix. Seriously yummy. Price: I find it pricey for the amount. It’s baking mix — not gold. 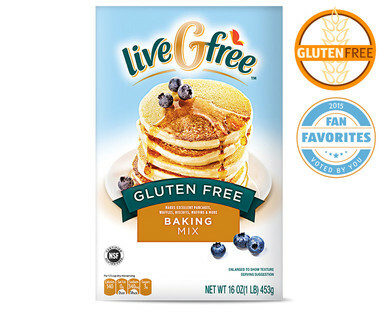 3) Aldi LiveGfree Gluten Free Baking Mix. 16 ounces. $2.99 at Aldi. Before I start my review on this product, I’d like to say one thing. 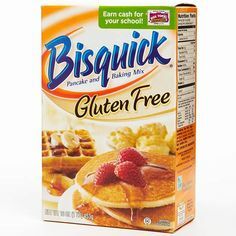 I think this product is identical to the Gluten Free Bisquick. So, if the reviews sound similar; it’s because the two products are VERY similar. Ease of use: Simple, Mix wet ingredients (oil, milk, egg) and add in a cup of baking mix. Blend well. Pour on to a hot griddle. Taste: Just like regular pancakes. Light, fluffy, and delicious. I prefer my pancakes super fluffy, and therefore add more baking powder. Price: $2.99! TWO NINETY NINE!! That’s UNHEARD of for a Gluten Free baking mix. WOO HOO! Just one more peek into the treasure trove known as Aldi’s. More on that in a future post, I promise. Thats all for today! Hope this helps y’all find delicious Gluten Free pancakes at the end of what can seem like a convoluted Gluten Free tunnel.